Are you exploring a new idea that has yet to reach its full potential? Are you pursuing interesting projects in our local community? Do you want to spark change in the lives of people around the community, and beyond? Do you have an idea worth spreading? The student organizers at TEDxSyracuseUniversity want to hear about it! 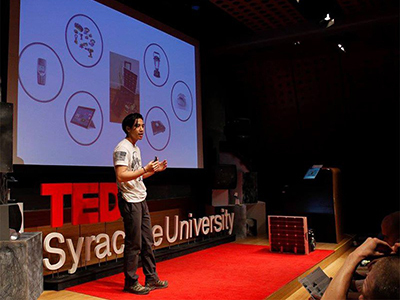 TEDxSyracuseUniversity, an independently organized TED event, is looking for speakers for its 2018 conference next April. According to the team planning the talk this year, proposals are measured by the relevance of the story as well as the ability the idea has to take off and change the lives of the audience in a positive, refreshing way. Candidates are considered more for their passion for their stories than the amount of public speaking experience they have. The ideal speaker has significant experience in the field he/she is discussing, but is also willing to put in the time and effort necessary to create a current, convincing talk. Organizers want speakers to reveal their hopes, dreams and fears on stage, and to give the audience a memorable performance. The team is looking for speakers from all parts of the community and beyond. The overarching theme for this year’s conference will be announced in upcoming months. TEDxSyracuseUniversity’s 2018 conference is slated to take place on April 21, 2018, at Slocum Auditorium. To apply or nominate a speaker, simply fill out this form by Jan. 26, 2018. Sponsorship for the TEDxSyracuseUniversity event is provided by the Ruth Ivor Foundation, the School of Information Studies and the Blackstone LaunchPad at Syracuse University.